We supply food delivery EPoS systems that are ideal for all types of delivery operations - pizza delivery, chinese food delivery, indian food delivery and all similar types of business. 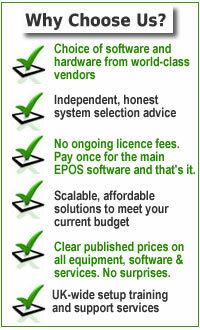 Our Food Delivery EPoS systems are affordable, yet scaleable from a single terminal to multiple networked terminals. With Telephone Caller ID, Customer Database and optional Postcode/Address lookup.